Bold flavors allow this side dish to create a tasty setting for the Mongolian Beef. Serve it with any stir-fry or as a stand-in for plain white rice. Bring water to a boil in a saucepan; stir in brown rice, gingerroot, oil, and salt. 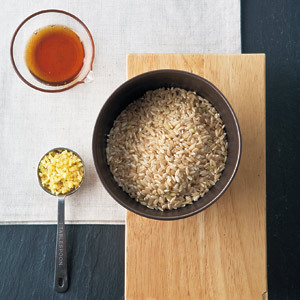 Cover pan, reduce heat to low, and cook rice until water is absorbed and rice is tender, 30–40 minutes. Remove pan from heat; let rice sit, covered, 5 minutes. Fluff rice with a fork before serving.